I am standing in the checkout line at the grocery store when I feel the tears coming. I am trying to fight them off, determined to not cry in the middle of Safeway, but I can't stop them. I pay for my groceries through a veil of tears, the cashier looking at me with alarm, and blindly push my cart to my car, unloading it and climbing inside to cry alone for a moment. 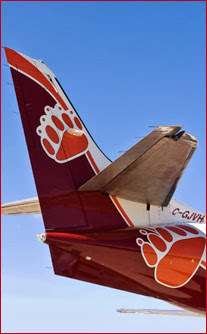 I am a habitual and compulsive email checker, and so it is in the grocery checkout line where I find the email from my sister saying she is sorry to hear about the crash of a Bearskin Airlines flight close to my former home of Red Lake, Ontario. That email stops my heart and sends me racing to the internet for details, where I learn a flight has gone down, killing five including the pilots, and leaving two survivors. For most it is probably just news of another crash of a plane from a remote airline flying in the wilderness of this country, but not for me. For me it is devastating, because I was a Bearskin Airlines employee for years, and Red Lake was my home base. Bearskin Airlines was the first, and only, airline I have ever worked for. We were quite the gang even back then, a maverick and upstart little airline that flew into cities like Winnipeg and fly-in only reservations like Pikangikum. We were co-workers, and friends, but we were family too, a collective of people who lived in the north and loved it, and who loved everything to do with airplanes and flying and that part of our vast country. I felt like part of a brotherhood back then, a collective of pilots and staff who shared a common lingo and a common turf, and who worked together, flew together, and grew to care for each other in profound ways. The pilots were an ever-changing cast of characters who had come up from flying bush planes and floats, who flew with us for awhile and then went on to fly "the big planes" with larger airlines. I trusted them implicitly and with my own life, flying with them dozens of times and always knowing my faith was well placed. They were bold and brave and certain, and I never doubted them, not for a second. I remember too, though, the dark days of winter when the snow would begin to fall heavily and I would wait alone in a remote airport near to my home in Cochenour. I was not only passenger service agent but radio dispatch too, and so I would wait to hear from the flights as they neared the airport to report of their impending arrival. And I remember late nights when they hadn't radioed in yet, waiting. It would be dark, and the snow was falling down as if the heavens had opened and every snowflake in existence was falling right there. Dispatch from Sioux Lookout would call and ask "Have they called in yet?". No, I would say, no, not yet, wondering where they were and worrying. And then the radio would crackle, and it would spit out "JVFlight 311 to YRL". "YRL to JV 311, there you are. There you are! What took you so long?" I would joke, and they would tell me not to worry, that they had been momentarily delayed by dealing with another matter and hadn't hit the radio yet. And then they would land and call me "Mother Theresa", telling me I worried too much and that they were "flyboy and flygirls" who didn't need "mommying", but they would laugh and smile as they said it, and I knew they appreciated my worry even though they didn't want to admit it. I recall one pilot who left us to fly overseas, and one day a fellow pilot told me of the news of his death during a takeoff in Africa. I was so overcome I had to sit down, because I had adored this young pilot. He was one of the best and brightest, and he had captured my heart with his smile and his sweet manners. He died doing what he loved but his death hit me hard, and as my time with the airline wound down I knew I couldn't work for an airline again, because of those nights spent sitting beside the radio, waiting for that call, and always fearing it would be the night the call never came. My heart hurts today, for those lost last night, the two survivors, the families involved, and all the employees of Bearskin Airlines, past and present, who must be in shock just as I am. I am lost in memories today of all those late nights at a remote airport in northern Ontario, staring at the radio and willing it to crackle to life with the sounds of an incoming flight, signalling that all was well and they would soon be safe on the ground. I am profoundly grateful that in my days at Bearskin that call always came, and we never lost a soul during that time. But I always knew there was a chance that one day that call would not come, and my heart would be broken. Last night I wasn't the one waiting beside the radio at that remote northern airport - and yet today my heart is still shattered by the call that never came.